Xianmen is the second largest city in Fujian. Legend has it that egrets once made home there, hence its another name of "Egrets' Island." The city is 1,516.12 square kilometers in area and has a population of 1.17 million. The best tourist season lasts from April through to November. Xiamen serves as a principal entry and exit for overseas Chinese to and from China and an ancestral home of many people in Taiwan. There are the Gulangyu Islet, Nanputuo Hill, Wanshi Crag, and Jimei tourist areas and a tourist route on the sea. The city handles "visa on arrival" to tourists from Taiwan and visa to foreign tourists to the Xiamen Special Adminsitrative Region. Xiamen is known for its local and special products. The vegetable dishes at the Nanputuo Temple and the medicinal food at Lujiang Hotel prepared according to ancient recipes are famous in Southeast Asia. Located to the southwest of Xiamen Island, Gulangyu obtained its present name during the Ming time. The islet is 1.78 square kilometers in area, and its coastline zigzags with the terrain. It is called a "shining pearl in the Orient" and a "garden on the sea" for the rocks that rise and fall in a neat way, the red-tiled houses nestling among green trees, the golden sand beach, the bizarre Riguang Crag that thrusts up abruptly above the ground, sea gulls hovering over the sea water as well as the reefs, cliffs, and peaks that enhance each other's beauty. There are two rocks piled up in the western corner of the islet. A vertical hole right in the middle of the rocks gives off a sound similar to that of a drum when surging waves dash on the rocks. Hence is the name of the islet. Gulangyu is a "home of music and pianists." It has fresh air, luxuriant trees, and flowers throughout the year. A component part of the Gulangyu Islet and Wanshi Mountain Scenic Area, the Wanshi Crag Scenic Area stretches for 26 square kilometers, of which 19 square kilometers are hilly land and the remainining seven square kilometers are flatland along the coast. Its main tourist spots include Wanshi, Taiping, Zuixian, and Huxi crags, the New Forest of Tablets, Zhongshan Park, and the Xiamen Botanical Garden. It was built on the beach in southwestern Xiamen Island in the 17th year during the reign of the Cling Dynasty Emperor Guang Xu. The fort occupies an area of 10,000 square meters, on which several dozens of cannons, Chinese and Western, are in position. Mounted on the two principal gun platforms are two cannons bought from Germany. each with a caliber of 208 milimeters and a barrel of 13.96 meters long. In 1986, Wanggui and Pangui terraces were built. 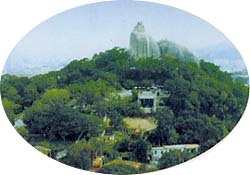 From the top of the terraces, tourists can see Jinmen Islands in the dis tance with the help of a telescope.